Cowabunga! Welcome to Lore Seeker, a series devoted to the legendary creatures left by the wayside of Magic story. In this series, I analyze a legendary creature card in depth, one that does not have much mythos surrounding it. I consider everything from the name and mana cost to the art and flavor text, extracting the essence of the card, refining that essence into a sticky wax, and applying that wax liberally to the deck. I also investigate a play style that fits the flavor and personality of the commander. 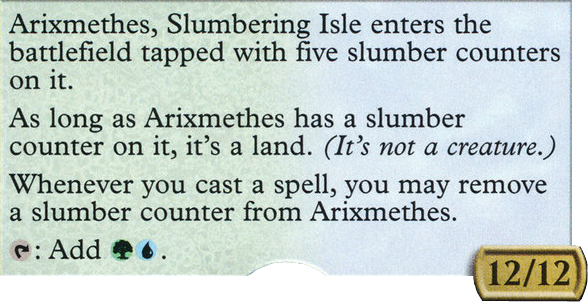 For this installment, we’re building around Arixmethes, Slumbering Isle. After exploring the blustery cold mountain peaks of Kamigawa (and trudging through this winter hellscape we call the Midwest), I decided that I needed a vacation to somewhere tropical. Since I can’t afford that, I made due with this article. 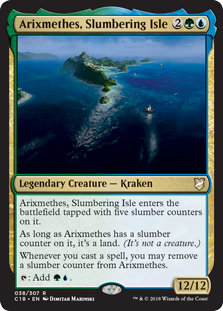 Arixmethes is a Kraken from the plane of Theros. It is an ancient beast of great power that disappeared long ago. The legends surrounding Arixmethes have become obscured, and the name is now used to refer to the city, a major polis, that once existed on the dormant creature’s back. It is believed that Heliod (the God of the Sun on Theros) smote the city and cast it into the sea. However, learned Therans know the truth: that Arixmethes was the island itself, awakened at last and hungry to dive back into the depths whence it came. 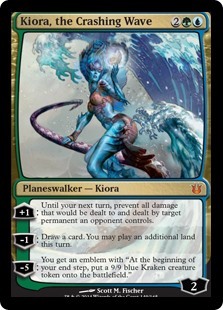 More recently, Kiora, the Crashing Wave heard of the true nature of Arixmethes and attempted to find and enlist it in her sea monster arsenal. 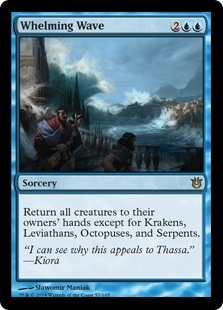 Thassa (the God of the Sea on Theros) would not allow Kiora to take this beast from her. The two battled it out and, realizing she was outmatched, Kiora fled, taking Thassa’s bident with her. The main question I want to answer is this: what sort of city was on this creature’s back? 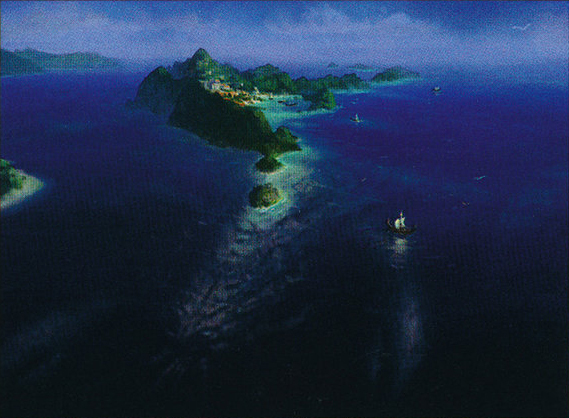 It has to be a Merfolk city; if it wasn’t before the submersion, it better be now! 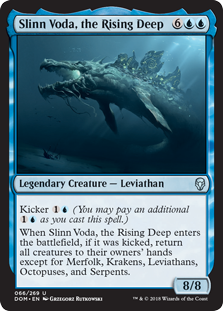 This means the bulk of the deck is going to be focused on Merfolk tribal. With the influx of support for tribal decks in the past couple years, Wizards has made it much easier to construct a tribal deck. 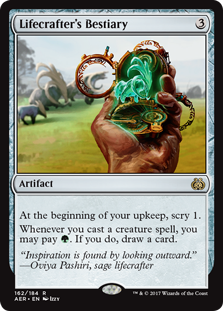 Building around a creature type equates to a larger number of creatures in the deck; it takes a critical mass to make this strategy hum. If we are going to designate a large number of slots to creatures we have to ensure that our hand stays full, the best way to do this is to include cards that allow you to draw a card each time you cast a creature (or a creature of a certain type enters the battlefield). 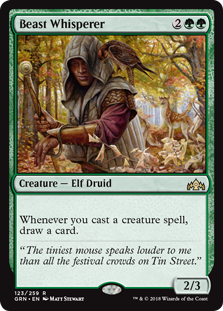 In blue and green we have plenty of options for this ability: Lifecrafter’s Bestiary, Kindred Discovery, Vanquisher’s Banner, Zendikar Resurgent, and the most recent addition of Beast Whisperer. This is a big sleepy creature, and when it wakes, it is rather devastating. Since those inhabiting its back are Merfolk, I have this amazing vision of a relaxed tribe of wanderers following the currents and flow of the sea, accepting the chaotic nature of the beast they find themselves beholden to. They adapt and learn the nuances it takes to survive in the conditions they find themselves in. As such, I believe the Merfolk society has learned to take advantage of their situation and have become amazing surfers. Can you imagine the wake this beast would generate? Righteous barrels galore! Not to mention those massive open ocean storms. We’re talkin’ 90 footers! Ride that pipe! Green: Tapping into the awesome power of nature, green relies on instinct and natural symbiosis while embracing the duality of nature; both orderly and chaotic as it is. Blue: Slow, methodical, and passive. Seeking opportunity, blue is a collection of resources and is an advocate of tinkering and creating the things needed for survival. Simic (green-blue): Green wants nature to evolve while blue wants to tinker and generate change through will. The combination of the two ideas imparts blue’s desire to tinker with green’s natural evolution to create a society of advanced adaptation. 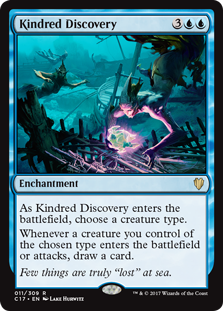 Having already explored how the Merfolk have adapted to their new home, the ideas of Simic ring true with our deck building decisions thus far. The symbiotic nature of the relationship between Arixmethes and the city is also in tune with the fundamentals of green. 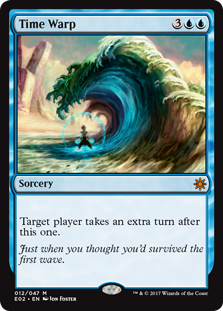 Add blue’s desire for creation and resourcefulness to the resourceful Merfolk surfers. They created a way to survive, thrive, and greatly enjoy their harsh ecosystem. A peaceful merchant port, active with ships coming and going. Just beneath the surface of the serene waters lies the head and massive claw of this gargantuan beast. This art is a thing of nightmares. The deep and Dark Depths of the sea are hiding more than anyone can imagine. The scale of this piece instills how massive Arixmethes is, and as a 12/12, that is rather important. These stats put this beast up in the category of the world-eating Eldrazi titans (Kozilek, Butcher of Truth and the like). Arixmethes is more a force of nature than a creature, unconcerned with predators of any kind. It makes me wonder if the creature grew bored and that is why it became so sleepy. The world may never know. Krakens are a creature of myth and legend originating from old Norwegian folklore. They were said to wander the Greenland Sea, and when they breach the surface they appear more like land than like a fish. 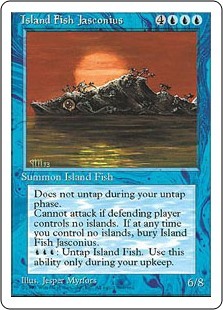 Arixmethes is not even Magic’s only living island; Island Fish Jasconius has been around for quite a while. In some tales, it is said that the beasts feast for three months and take three months to digest. This could be an explanation for the slumbering Arixmethes as well. Given the size of our living island, it could take even longer for it to digest, potentially many years in hibernation. 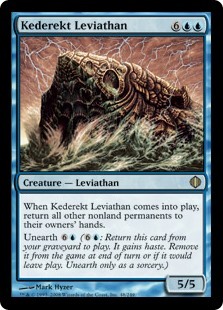 The appearance of great sea beasts from the MTG perspective is often associated with returning permanents to their owner’s hands. The size of these massive creatures creates such an upswell that it washes the board clean. 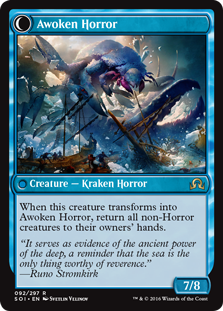 The top end of this deck will be focused on large ocean beasts that will help to end the game as well as functioning as additional board wipes. 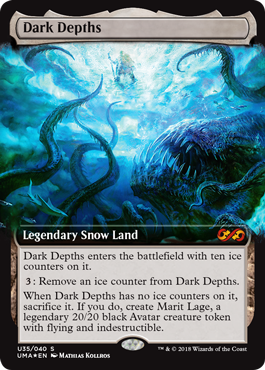 Massive hibernating beasts seems to be a reoccurring theme with Magic, as there is yet another sleepy Kraken: Thing in the Ice. 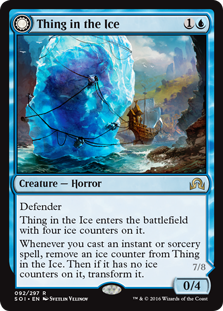 Awoken Horror (the transformed side of Thing in the Ice) is yet another sea creature board wipe that fits our deck flavorfully and mechanically. 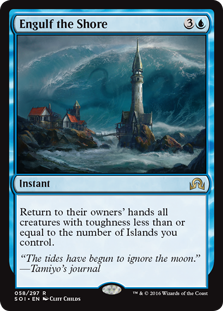 I have also included a very small subtheme of the Awaken mechanic (Coastal Discovery, Part the Waterveil, etc.) to cement the idea of the world coming to life around the player. There were a lot of cuts I had to make to the deck; anytime a deck is focused on a tribe, it eliminates a lot of utility spots to reach the ever looming critical mass. It is a mid-range/aggro deck that relies on cheap creatures and multiple board wipes to get a game win. 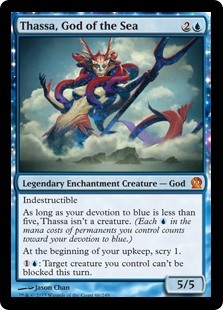 The average Arixmethes deck on EDHREC seems to be tribal as well, but people seem to be focusing on ‘sea monster tribal’ or general Simic goodstuff. 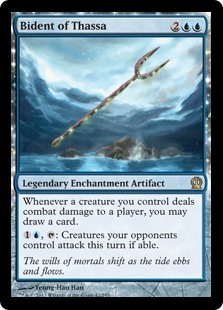 Though there are plenty of creatures better suited to command a Merfolk tribal deck, I think Arixmethes has a spice factor that people will not see coming. This deck was way fun to craft. Gnarly chop, wicked barrels, and all the tools to navigate that sweet open ocean without getting pitted. Wapahh! Please leave your criticism, desired future lore-seeking legends, and any further comments down below! I read it all and have a growing list of creatures to cover. And for those of you who actually surf… I apologize.